Why Is Flat Roofing So Popular? HomePonding Water 101Ponding Water 101Why Is Flat Roofing So Popular? An increasing number of homeowners and business owners are discovering the advantages of flat roofing. Basically, flat roofing involves a horizontal or level base that’s fixed to the ceiling joists of a house or building. A roof’s slope is known as its pitch. Compared to sloped or pitched roofing, flat roofing is practically level. But a flat roof isn’t 100 percent flat as it has a slope of about 10 degrees. Flat roofing has been used since ancient times and continues to be the norm in arid regions. Here are some reasons why flat roofing is so popular among homeowners, along with the advantages of having a flat roof on a commercial building. Easy accessibility is probably the top reason for their popularity. Consider that a flat roof is much easier to climb and walk on when you need to inspect the surface of your roof. As a result, this type of roof is more stable and safer than sloped roofing. A flat roof has more square footage for accommodating equipment, such as exhausts and air conditioning vents. Additionally, as the surface is level, it’s able to provide stability for heavy items, even while they’re in operation. Durability and longevity are other reasons why many people choose this type of roofing. Consider that the average flat roof can serve you for 30 years or longer. This is mainly because it’s composed of gravel and tar. Flat roofs cost less than pitched roofs, and they’re also less expensive to install. 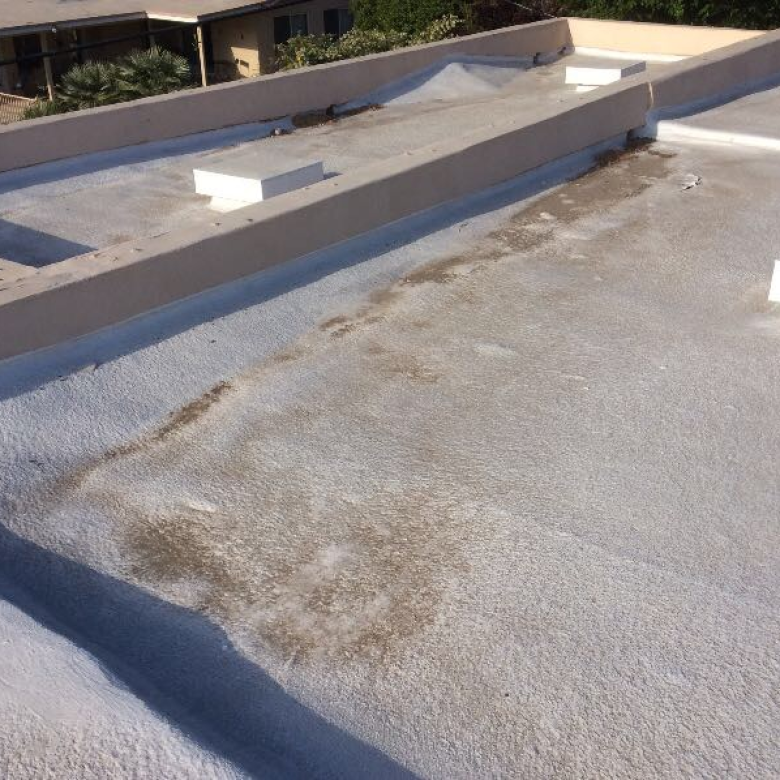 What’s more, re-coating a flat roof is cheaper. Flat roofs can be used as roof decks. Besides providing a large space for relaxing and entertaining, a roof deck also helps in protecting a roof from damage. Flat roofing is the typical roofing found on commercial buildings, such as shopping malls, warehouses, large department stores, condos, apartment buildings and manufacturing plants. This is mainly due to the considerably larger size of commercial buildings as compared to residential structures. Just think about what would be involved to have a sloped roof on a building as large as a department store. Moreover, the installation would entail an enormous amount of additional material. It’s easier to install a flat roof on a commercial building, and it doesn’t take as long. Also, just as a residential flat roof, flat roofing on a commercial structure is easier to maintain and to access, as well as offers more space for ventilation, heating and AC units. Furthermore, flat roofs on commercial buildings provide green roofing options. 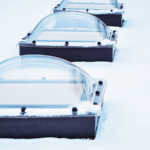 Some people are even growing small, drought-resistant plants on their commercial roofs, which can help in lowering heating and cooling costs, in addition to extending the life of a roof. Although both flat and sloped roofs require regular upkeep, flat roofs are easier to clean. Flat roofs are a good choice for people living in regions that receive minimal rainfall. This type of roofing is popular among homeowners who want a contemporary-styled home. Hire an experienced and trusted roof installer who’s able to handle challenging details, regarding specific installation instructions. Be sure your flat roof is able to withstand strong winds. Therefore, it’s important to know information, such as the wind uplift design pressures for a roof’s perimeter and corners. Check to be sure that your flat roof provides sufficient drainage and isn’t totally flat. 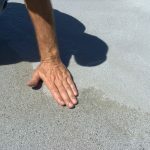 A roof that doesn’t have a 10 percent slope can result in ponding water, in addition to fungus and algae developing, which can strain a roofing structure. Ponding water, which is water remaining of the surface of a roof for longer than 48 hours after rainfall, can be a problem for flat roofs. In fact, even the smallest low spaces of a flat roof can lead to ponding water. 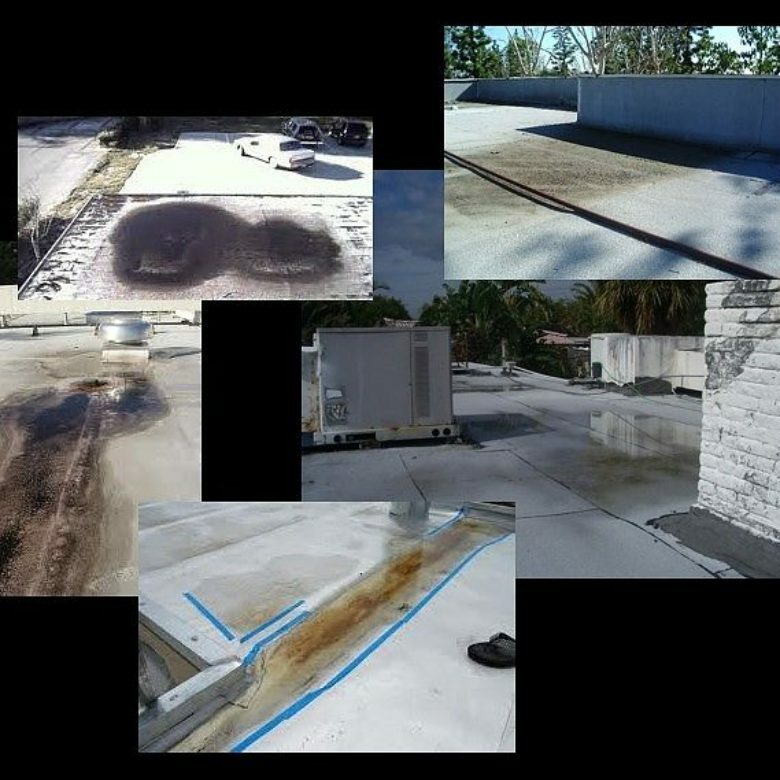 Fortunately, RoofSlope has a product that provides a low-cost solution for solving inadequate drainage that doesn’t affect the integrity of an existing roof. Questions? Don’t hesitate to call RoofSlope. Our product for correcting ponding water offers an easy, quick method for filling in low areas on flat roofs for obtaining a positive slope. Please contact us and learn more about our products and services.